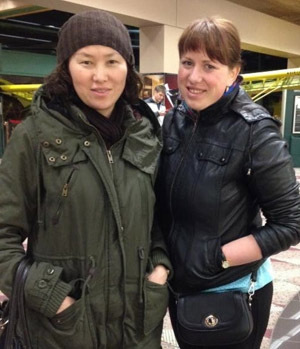 ELAW Fellows Oksana Imetkhenova and Liubov Balandina returned to Ulan-Ude earlier this month with new tools and inspiration to protect Lake Baikal and surrounding forests. "The ELAW Fellows Program was very intense and fruitful. It helped us a lot to see with our own eyes, ask questions, and learn new things -- not only in the field of environmental law, but about the USA as a whole." Oksana is Chair of the Department of Ecology, Health and Safety at the East Siberia State University of Technology and Management. Liubov is finishing her degree in environmental engineering, and is getting a second degree in law, at the same University. Both work with the Buryat Regional Organization for Lake Baikal. During their Fellowships, Oksana and Liubov met one-on-one with ELAW Staff Attorneys and Scientists, and U.S. experts in forest protection and litigation. They toured Oregon's national forests with Zane Smith, a retired U.S. Forest Service officer who spent many years working on forest issues in Eastern Siberia. They met with local forest experts and learned about current research on forest landslides. They attended classes at the University of Oregon School of Law, presented their work at the Public Interest Environmental Law Conference, and collaborated with ELAW Fellows from Mongolia, Panama, Mexico, Canada, Turkey, and Uganda. After nine days in Eugene, they toured Lake Tahoe with ELAW Board Member and mining expert Dr. Glenn Miller, met with a representative from the Lahontan Water Quality Control Board, and toured a controversial gold mine and surrounding community in Virginia City, Nevada. Many thanks to the Earth Island Institute and the Trust for Mutual Understanding for making these ELAW Fellowships possible.